Books Are Sanity!!! 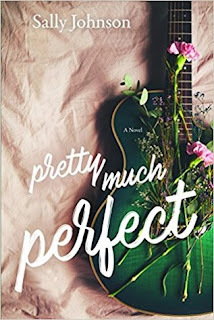 : Pretty Much Perfect by Sally Johnson, LDS Blog Tour & Giveaway!!! Pretty Much Perfect by Sally Johnson, LDS Blog Tour & Giveaway!!! Camille Weston, a recently returned missionary, anticipates returning to college for her degree and perhaps to meet a nice guy. A sensible young woman with her future mapped out, Camille would never do something dangerous—like pick up a stranger on the side of the road. And yet, inexplicably, she does just that. This is one split-second decision that changes everything. Determined to lend assistance, Camille gets more than she bargains for when she is roped into helping Liam, a handsome British man, with more than just a ride. As they are thrown together over the coming days and their mutual attraction grows, they realize they just . . . click. That is, until she makes a shocking discovery: the mysterious stranger is William Liam Jones, lead singer of the popular band Gear. Camille has never been one to swoon over a celebrity, and she knows her and Liam's lifestyles could never be compatible. But how can she convince her heart to listen to logic? Where has this book been all my life?!? It is hands down amazing and I couldn't get enough of it! Camille is a straight shooter, straight laced Mormon girl, and happens to be clueless when she stumbles upon famous rockstar Liam. It seems she is the last one to know who he actually is. And the budding attraction is too hard to ignore between the two of them. But Liam isn't a member of the church and Camille feels like they could never work....but could they? Is what is happening between them even real or is it just a fling for Liam? I absolutely devoured this book, DEVOURED it people! Johnson takes you on one heck of a ride and I was all in with my hands up in the air, enjoying every single moment! This is the book you don't want to miss out on! This is the book that will keep you up all night long and when it is over you will want to throw it (or your kindle) and demand that the author give you more because it is over!!! Buy this book, it is that simple. a Rafflecopter giveaway Shout out to my brother Jeremy Eveland who's been helping me with my classes. Thanks bro!